You are at:Home»Cruise Lines»Celebrate “Halloween on the High Seas” with Disney! Celebrate “Halloween on the High Seas” with Disney! Forget Christmas, Easter and birthdays. Halloween is our new favourite holiday and for all out at-sea celebrations, Disney sure knows how to throw a party! This year the line will continue its world famous “Halloween on the High Seas” themes that see ships decked out from bow to stern in spooky get-up. Across the fleet, Disney decorators will be transforming vessels into wicked wonderlands brimming with frightfully fun activities, events and experiences. Think themed deck parties, eerie entertainment, bloodcurdling decorations and more. Not to mention a glut of unique Halloween themed menu items that will terrify the tastebuds! The voyages will run throughout September and October, with October 31st receiving special attention, of course! Want to know more? Check out our sneak peek at what Disney’s got in store for Halloween cruisers in 2015. This is one of our personal favourites as it really encompasses the essence of the magical Disney experience. It transforms throughout the cruise and is a constant source of enchantment for cruisers young and old. What better way to celebrate Halloween than with good old Mickey Mouse himself? The party will be attended by a myriad of beloved Disney characters, all decked out in extra special Halloween costumes. The night will feature games, dancing and candy galore. Today’s cruise ships offer guests all the perks of on-land entertainment and this interactive movie experience is guaranteed to delight. Guests are invited to play their very own part in the action, followed by a meet and greet with Jack Skellington and Sally. Are you brave enough to face some of the ghastly sea tales spun by a shadowy sea captain storyteller? If so head up to the top deck where Disney’s boldest cruisers can lose themselves in some terrifying tales. Whoever said Halloween couldn’t be celebrated with a dash of class? Certainly not us! On selected nights the atrium will light up with lively Halloween themed tunes performed by a live band of spooky musicians. Don’t forget your dancing shoes! For adults that love to trick or treat, this nightly event is guaranteed to please. When the sun goes down the adult’s only entertainment district will be transformed into a ghoulish glen. There’s even a costume competition for the best dressed grown-ups! To get guests in full swing celebration mode Disney will be playing a series of Halloween-themed movies throughout voyages. Catch the in the Buena Vista Theatre, the family friendly Funnel Vision poolside screen and in private staterooms. Halloween is the perfect excuse to serve up frighteningly delicious food and Disney has wholeheartedly embraced the opportunity. The in-house chefs have conjured up a cornucopia of treats including pumpkin filled chocolate mud cake, spider cookies and the aptly named Spooky Juice. 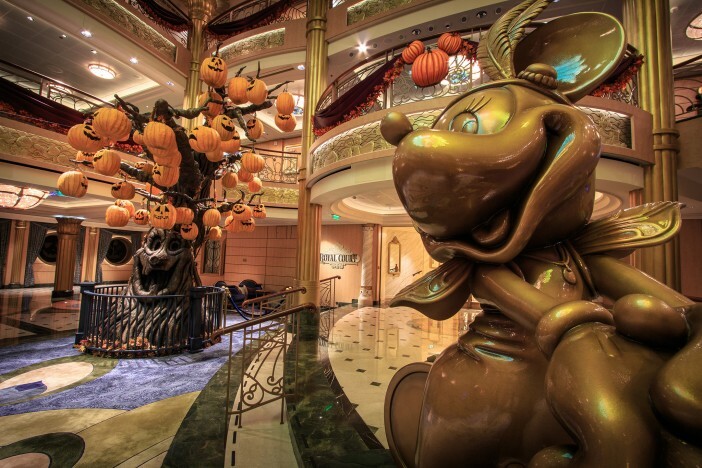 Catch Halloween on the High Seas on-bard Disney Fantasy, Disney Wonder, Disney Magic and Disney Dream.